My husband is an avid mountaineer. 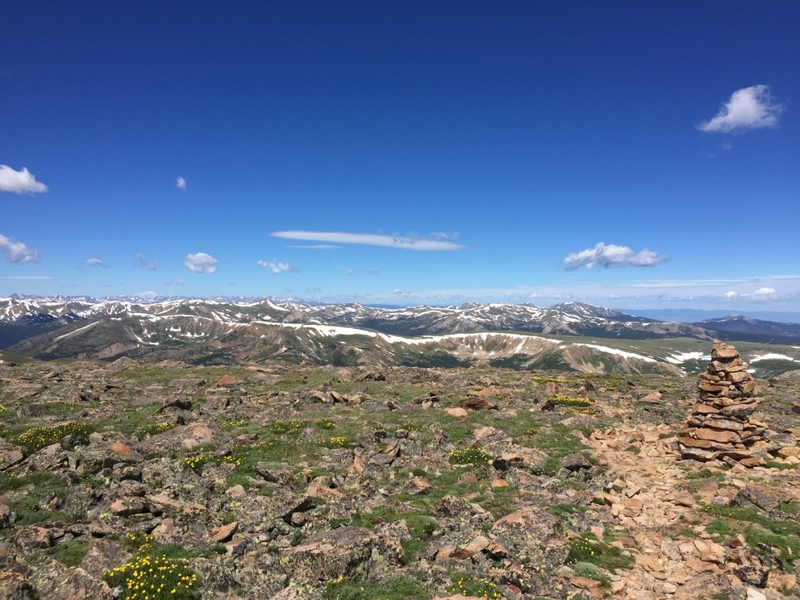 He has over 40 of Colorado’s 14ers under his belt as well as many, many 13ers. He gets up above tree line and at elevation on a regular basis. Me on the other hand – I may live at 5,280 feet but I am pretty much a flatlander. I don’t get up to the mountain nearly as much as I would like to. So, I was so excited when my husband suggested that we hike Mt. Flora. Mt. 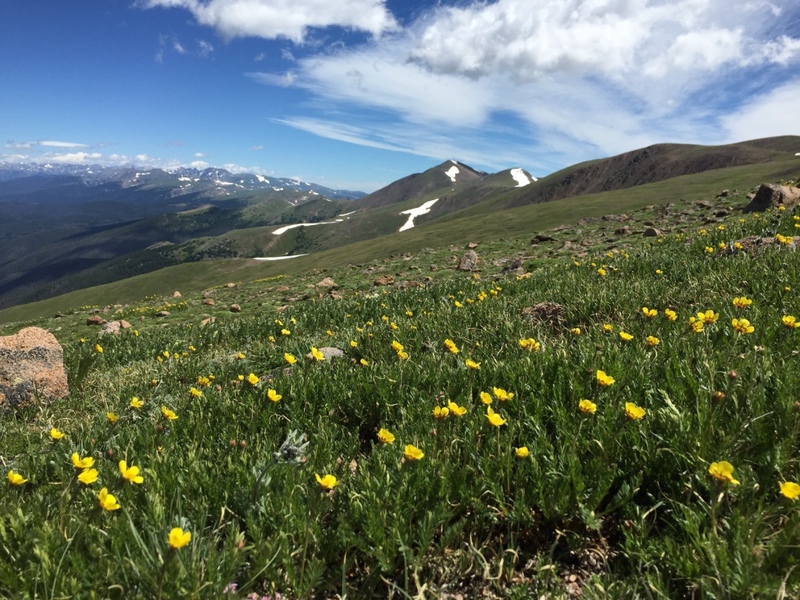 Flora is a 13er near Berthoud Pass. Mt. 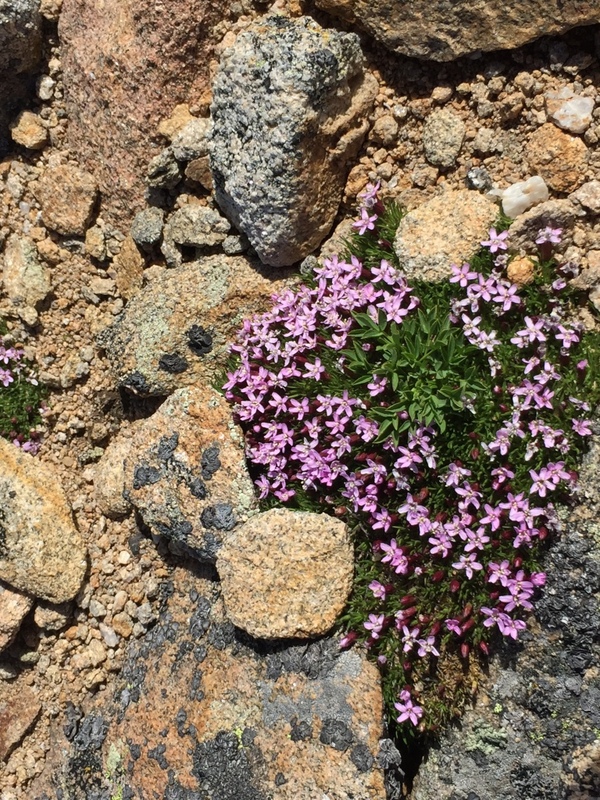 Flora stands at 13,146 feet and the majority of the 7+ mile hike is on a ridge high above tree line. 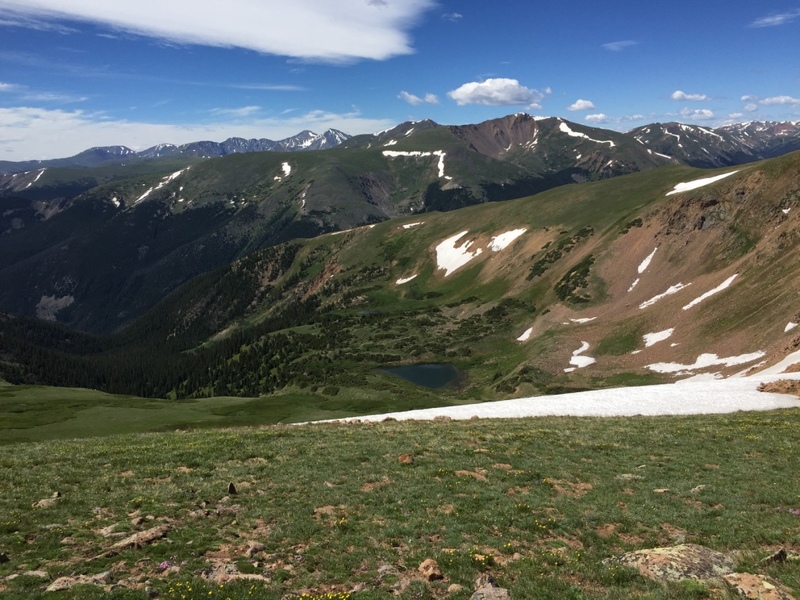 According to SummitPost the total distance from Berthoud Pass to Mount Flora is 3.6 miles one way with about 2200 feet total elevation gain and 350 feet elevation loss. We got to the parking lot at Berthoud Pass around 9:00 a.m., coated ourselves in sunscreen because we would be walking directly next to the sun, and headed up the old Berthoud ski hill towards Colorado Mines Peak. 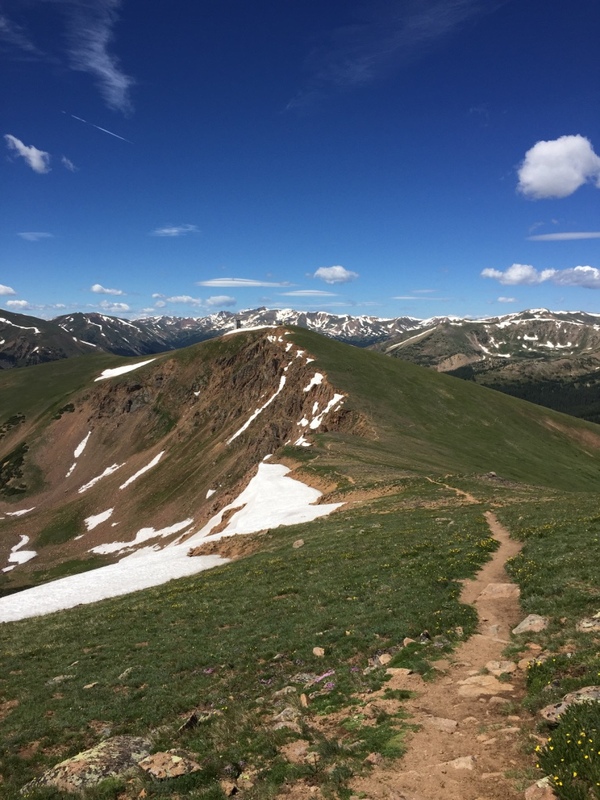 Instead of continuing up the road to the radio towers on the top of Colorado Mines Peak we took the trail pointing towards Mt. Flora. From this point Mt. Flora is 2 miles away. The trail was very easy to follow and was mainly made up of fine gravel and stones. While you are pretty constantly climbing upward the incline never seems overwhelming. The higher we climbed the more mountains you could see and the views were incredible. There were vast open fields that made you think you were in a scene from The Sound of Music. You expected Julie Andrews to start running across the field singing The Hills Are Alive at any moment. On this hike you get a lot of bang for your buck. For a relatively easy hike you get to see a lot of mountains. The higher we climbed the more beautiful our surroundings became but the higher we climbed the windier it got. At times there was probably a 30+ mph sustained wind. The wind was definitely the most difficult part of the hike. Because it was a relatively warm day the wind wasn’t freezing cold but it was just constantly blowing in your face. Before long my eyes and nose were running and at times it was hard to catch your breath. But, we tucked our heads and continued upward! Along the way we saw so many wildflowers. 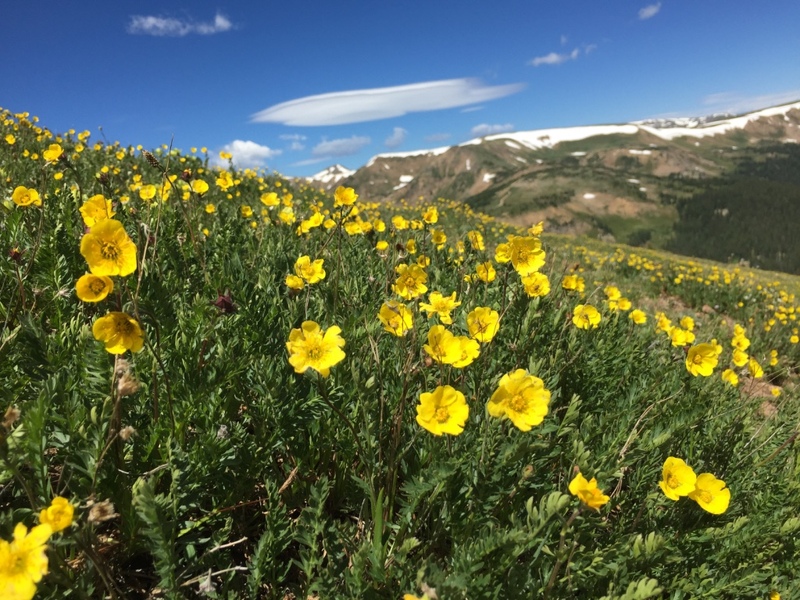 Colorado’s rainy spring and summer has lead to an amazing wildflower season and the greenest I’ve ever seen Colorado. 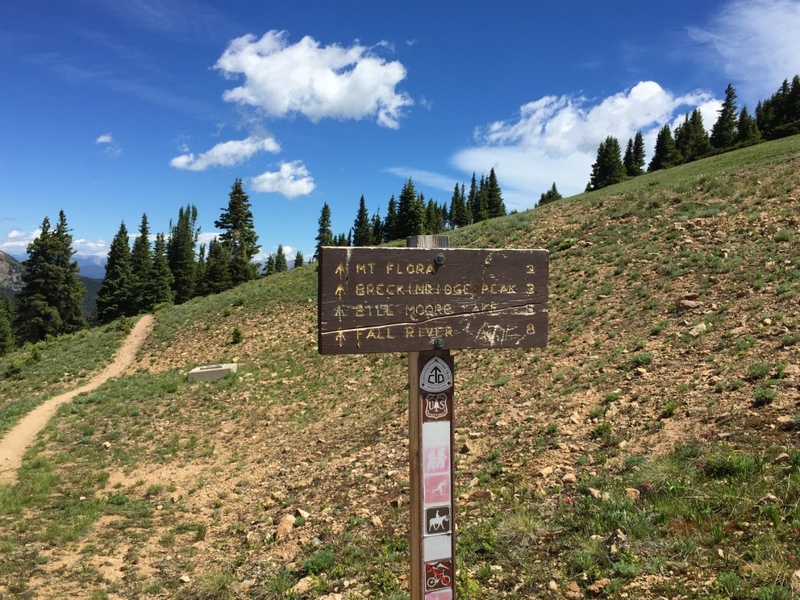 There are a few of what some might consider false summits along the way (or in my case I had no idea which mountain we were going to summit so when we passed over one and headed to the next I didn’t even realize and just thought it was part of the hike). We hit the summit in about two hours and spent some time taking pictures and visiting with a friendly marmot before heading back the way we came. We passed a lot more people starting up the trail as we were headed down then going up which always makes me worry a little bit. Living in Colorado you need to be thunderstorm aware and get up and down mountain as early as possible in the day before the thunderstorms roll in. I think this summer has been one of the most dangerous for lightning strikes and its hard to go more than a week without seeing another news story about people getting struck while hiking above tree line. So my PSA for the day – don’t be an idiot, hike early, and keep your eyes to the sky! It took us significantly less time to get back down then heading up and before noon we were back at the truck and ready to head to Idaho Springs for pizza at Beaujo’s. There is nothing more satisfying after a day of hiking or skiing then pizza at Beaujo’s! What is your favorite hike and what makes it so special?